Photo of Sidney Nolan's "Snake" by jeffowenphotos via Flickr. 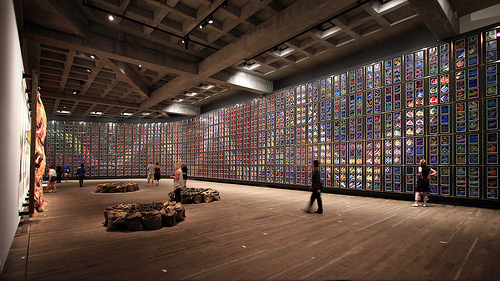 A relatively new gem on the world’s museum stage–it reopened in January 2011–MONA was quickly added to my list after I saw a picture of Sidney Nolan’s “Snake” that they have on display. Intrigued, I decided to learn more about the museum. The result? About a hundred other reasons for me to save up for a trip to Tasmania. 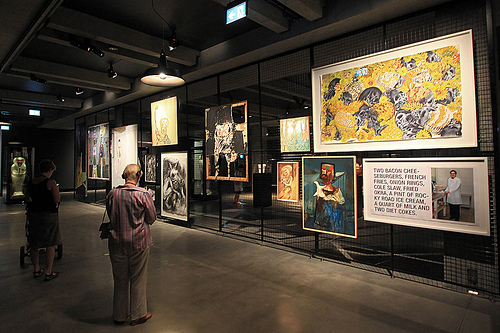 MONA’s collection ranges from contemporary art to Egyptian antiquities, with all sorts of odds and ends in between. 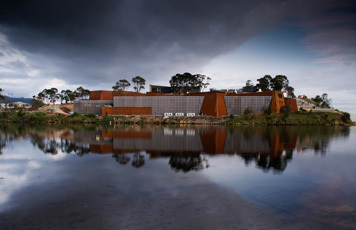 According to discovertasmania.com, “MONA takes a different approach to interpretation: there are no labels or wall texts. Instead, visitors are given a touch-screen device, which is sensitive to their location in the museum–showing them works in their proximity. Called the ‘O’, it allows visitors to select the level of information they need and to vote for works they ‘hate’ or ‘love’.” While that’s all very interesting, I am also intrigued by what MONA has going on around the art collection. Photo by jeffowenphotos via Flickr. David Walsh, a professional gambler, art collector, and founder of the museum, has described MONA as a “subversive adult Disneyland,” and I can see what he means. The museum is beautifully situated in the cliffs rising from the banks of the River Derwent on the grounds of the Moorilla Winery, and MONA’s truly modern architecture manages to fit in with its rather breathtaking natural surroundings. Given its proximity to viticulture, it should come as no surprise that visitors can sample offerings from the winery. However, they can also play in the hotel pool, dine in the museum’s world-class restaurant, or even enjoy a pint at the on-site brewery.